OH. MY. GOD. These are insanely amazing. I will admit, I am actually pescetarian, and I do eat seafood on a semi-regular basis, but I had eaten quite lot of it over the weekend for my sister’s bachelorette party (limited food selection, but raw oysters are amazing) and I was still craving something from the sea. I have always had an almost cult-like obsession with crab cakes. If I did not make these myself, I would have sworn they were made of some kind of seafood. 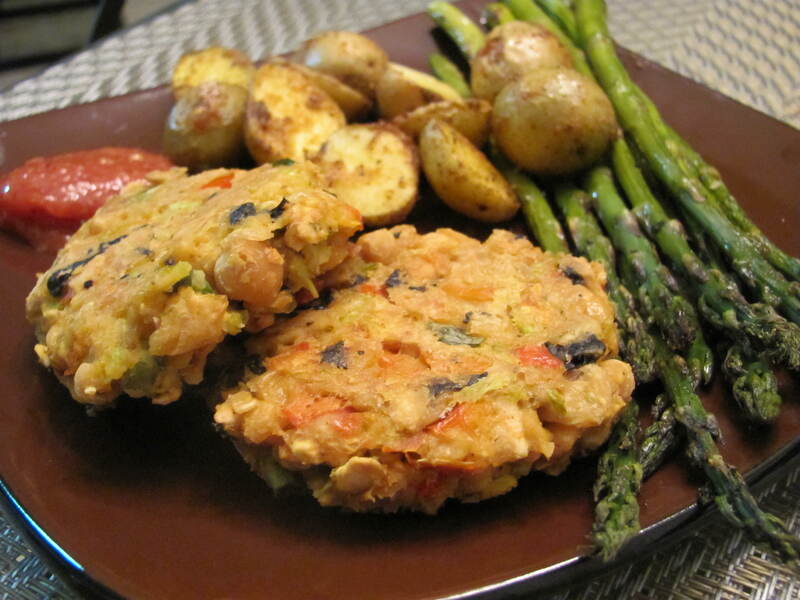 Sushi nori (the black seaweed sheets used in sushi rolls) lends that oceany fishy taste and the chickpeas are the perfect plant protein for these crabless crab cakes! Begin by heating the oven to 370. Open chickpeas and strain all liquid from the can. Make sure there is NO liquid because you don’t want runny crab cakes that won’t stick together. In a medium mixing bowl, smash chickpeas with a potato masher. I smashed mine as much as I could with the potato masher, then switched over to a regular spoon to flatten them out completely. Make sure there are no whole chickpeas left. Chop green pepper, red pepper and celery into manageable pieces and chop finely in a food processor. Add to bowl with smashed chickpeas. With the kitchen scissors, snip up the sheet of sushi nori seaweed into fine pieces. I found it almost impossible to cut with a knife the way I wanted, plus I am really impatient, so I used the kitchen scissors because they were faster and I could get smaller pieces. Add chopped sushi nori to the bowl along with the rest of the ingredients except the saltines. Crush the saltines a few at a time over the bowl into very fine crumbles (no big cracker chunks), then mix everything very well. On a cookie sheet sprayed very generously with nonstick spray, place balls of the chickpea mixture and flatten with your palms to about 1/2 inch to 1 inch thick. Bake for 10 minutes on each side (total 20 minutes bake time). Makes 9-10 crabless crab cakes! Excellent served with cocktail sauce and a squeeze of lemon or with tartar sauce – OR just by themselves! Imagine these on a burger bun – holy crab cake sandwich nirvana, batman!